If you only order one kind of taco here, let it be the birria taco. We all have our reasons to count down to the weekend, whether it's sleeping in past noon, going out with friends, or venturing out for a hike. As for me? Lately, I've been eagerly anticipating the weekend so I can eat at La Grana Fish, a tiny roadside trailer with a few outdoor tables that's only open on Saturday and Sunday. And I'm not alone, either. On weekend mornings — sometimes even before La Grana opens — you'll find customers eagerly waiting outside, seeking the alleged hangover-curing properties of birria and aguachile. There are a lot of things that stand out to me about La Grana Fish. Its diverse menu, ranging from birria tacos to fresh tuna tostadas to loaded baked potatoes, is impressive, especially coming out of such a small kitchen space. The food is visually appealing without being fussy; take one look at La Grana's Instagram page, with drool-worthy photos of shiny metal trays loaded with birria tacos, quesadillas, and mulitas, and you'll see why the place has amassed nearly 10,000 followers. And then there's the flavor of the food, which is some of the best I've tried this year. Owner Alvaro Ramos started La Grana Fish back in August with the help of his girlfriend, Ana Morales. The name La Grana comes from Ramos's hometown of Autlan de la Grana in Jalisco. That's where he learned to cook from family, starting when he was a little kid. Later on, he and his family owned a restaurant in nearby Guadalajara, and he attended culinary school there for a couple of years before coming to the United States. Ramos's stateside résumé includes work at El Agavero in Montclair and the Guadalajara taco truck in Fruitvale, both of which are owned by his cousins. La Grana Fish is his first solo venture, and the menu draws inspiration from his native Jalisco as well as Baja and Salinas. In fact, a baked potato shop down in Salinas was the unlikely inspiration for La Grana Fish. Morales used to live there, and when Ramos came to visit her, they'd visit the baked potato shop together. Eventually, they started making their own baked potatoes at home and sold them to friends and family on Sundays. That got Ramos thinking that he should start his own business, and La Grana Fish was born. With "fish" in La Grana's name, it only made sense to start with the seafood dishes. I went with the tuna tostada: a generous portion of raw tuna in chipotle mayonnaise, topped with red onions, cucumbers, jalapeños, and sliced avocado. Don't let the pricing of the tostadas scare you; although the tostada was listed as $9, each order actually came with three tostada shells on the side to build your own tostadas, and there was more than enough tuna to do so. The rich tuna melted in my mouth along with the fatty avocado, making for a bite that was somehow rich and light at the same time thanks to the freshness of the red onions and jalapeños. The crunch of the tostada and cucumbers complemented the creamy avocado and soft tuna. Next up was the green aguachile tostada with shrimp. Like the tuna tostada, this one came with an astounding amount of shrimp, along with cucumbers, red onions, and avocado in a spicy, citrusy green liquid. The shrimp were sweet and firm, and the aguachile liquid was simultaneously cooling and fiery — a recipe that made me want to keep eating and eating despite the burning heat. For those who want fresh shrimp without the spice, the ceviche is a good option. Here, the shrimp is served with avocado, diced tomatoes, cucumbers, and onions in lime juice, creating a flavor that's simultaneously zesty and sweet. The menu also features Baja-style fish and shrimp tacos, with lightly breaded seafood topped with cabbage slaw, pico de gallo, and chipotle mayonnaise. The fish version was moist and flaky, but I preferred the shrimp version, which allowed the natural sweetness of the shrimp to shine through while maintaining a firm, bouncy texture. If you only order one kind of taco at La Grana Fish, though, let it be the birria tacos. The birria is made by slowly simmering beef for up to six hours in a mildly spicy red chile broth that eventually develops into a rich, beefy consomé. The tortillas for the tacos are flavored with a splash of consomé, giving them a red-orange color. They're grilled until crispy, served with cilantro on the top and grilled onions on the side. The result is a taco that's crisp around the edges and juicy in the middle. 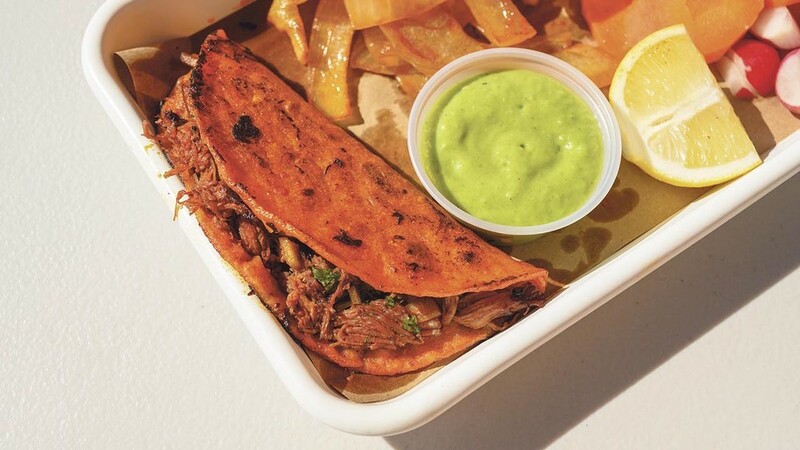 The birria tacos on their own are tasty, but for extra points, go with the quesabirrias, which add a thick layer of melted Monterey Jack to create satisfying cheese pulls with every bite. Don't forget an order of consomé on the side so you can dip your tacos in it. If you're going for the birria or fish tacos, you may as well build your own charola autlense, which translates to Autlan-style tray. Upon request, customers can fill up an Instagram-worthy metal tray full of tacos and other treats from the plancha. Try the mulitas: two stacked tortillas stuffed with cheese and meat that combine the light crunch of a crispy taco with the gooey cheesiness of a quesadilla. The cheese oozes out around the edges of the mulitas, creating a halo of crunchy fried cheese. The quesadilla is a solid bet, too, made with a flour tortilla that's griddled to a toasty brown without becoming oily or greasy. Don't forget to top everything with the dozens of hot sauce options offered at the table, or better yet, one of the three homemade salsas, including red salsa made with chile de arbol, green salsa made with tomatillo and jalapeño, or creamy avocado salsa.